Picture 1: Rement Miniatures #9 from the "Elementary School Kid" series released in 2006. Picture 2: The Re-ment Miniature Close-up. Picture 3: The actual piggy bank in Japan. A lot of high tech gizmo laden piggy banks are available in the Japanese market. 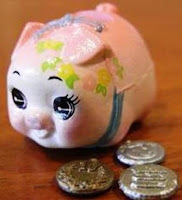 There are ones which allow you to "support" a character in your piggy bank by feeding it money and other ones which makes noises. Finding a traditional pink pig piggy bank becomes a difficult task. Old or new piggy banks are a household fixture in most family-orientated homes. At times when money was running low, the hammer would come out and eventually the cute piggy bank would be smashed. But "kawai so".....the cuteness of the piggy bank itself stifles most efforts to get it destroyed, thus helping the family to save money! And in the end, that money does not go to waste, as families present it as a gift to family or friend on their birthday, how lucky......I only saved for 3 months!